Big Brother 16 Spoilers Thursday July 3rd: Which Houseguest Will Be Evicted – Paola Or Joey Going Home? Season 16 of Big Brother has been officially under way for a week now on CBS, and it has been one eventful week. Big Brother spoilers teased that Season 16 would be the “twistiest” yet, and they weren’t exaggerating. Since the BB16 premiere last week, two HOHs were crowned — Caleb and Frankie. Caleb and Frankie nominated Paola, Brittany, Victoria, and Donny for elimination. The first ever Battle Of The Block competition took place, and Brittany and Victoria won, saving themselves from the block and dethroning Frankie. Donny won the Power of Veto and saved himself, so Caleb and his alliance decided to backdoor Joey and put her up on the block with Paola. According to Big Brother spoilers, on Thursday July 3rd, the houseguests will vote live with Julie Chen and evict the first player of Season 16. If you have been following the live feeds online, then you probably realize it isn’t looking good for Joey. The general consensus among the houseguests is that she will be receiving the most votes for eviction. Paola comes across as probably the weakest player in the house, so there is no reason for anyone to want to vote her out. She has bombed every competition she has played in this week. She seems to have no endurance, coordination, or spelling skills. Paola isn’t a threat to anyone in the Season 16 house. Joey dug her own grave earlier this week when she took a handful of the girls aside in the bathroom and asked them to join an all girl alliance with her. It may have been one of the most awkward things to watch…ever. All of the girls refused to make eye contact with her and kind of snuck away from her “secret girl meeting” one at a time. They refused to join her alliance. Little did Joey know the eight strongest players in the house, including two of the girls she was trying to recruit, had already formed an alliance called the Bomb Squad. 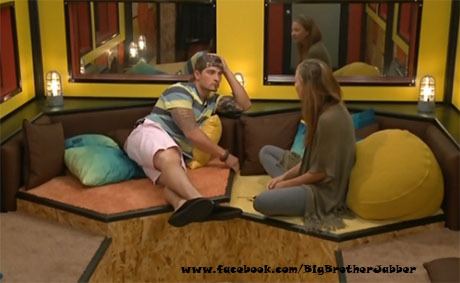 Amber, one of the members of the alliance, ran upstairs and told Caleb that Joey was trying to start an alliance. Apparently, Caleb and the Bomb Squad are allowed to have an alliance, but no one else in the house is. So, that warrants Joey’s eviction. So, Big Brother fans, who do you think will be evicted on Thursday, July 3rd? Paola or Joey? Joey was the original member of America’s Choice…do you think that, if she is evicted before America gives her any tasks, fans will be able to vote for a new houseguest to be on their team? Let us know what you think in the comments below and don’t forget to check CDL for all of your Big Brother 16 spoilers. Big Brother 16 Spoilers Wednesday July 2: Power Of Veto Competition – Will Donny Or Paola Win POV and Save Themselves?